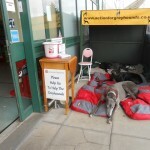 A very busy weekend meeting lots of people and being able to spread our awareness further. 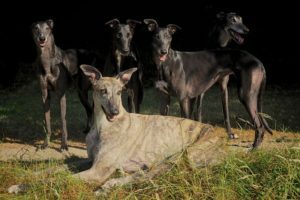 Two separate groups of people raised concern of their workplace either going greyhound racing or considering going for a ‘ social night out’ and we were happy when they willingly took some of our leaflets to distribute at work, hopefully resulting in deterring more people from supporting the industry. 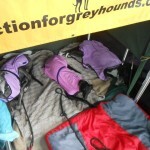 We had a great spot for our awareness station and for most of the day, the hounds were kept in the shade, but once the sun moved around late Sunday afternoon, the hounds wore their Afg ‘wet coats’. 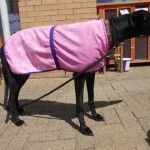 The coats gathered lots of interest, which is good, as they should be featured for sale on our website very soon, so lots of hounds can benefit from them too this Summer. 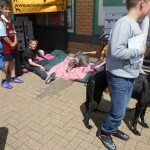 Lots of interest from children, two of the group of young lads featured here had rescued dogs and told us they couldn’t bear any cruelty to animals and they all expressed disagreement with greyhound and horse racing, which is good, considering they live in a town with a greyhound and a horse track nearby. 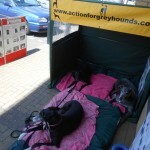 Another very busy weekend at one of the three popular Norwich Pets at Home stores. 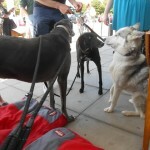 A lot of hound socializing going on, with many people not realising that greyhounds can and do interact with other dogs, large and small. 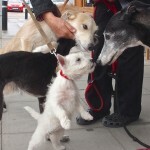 Of course, sighthounds do have that ‘extra special’ relationship when they meet. On the Saturday a customer told us he and his wife had been to ‘a night at the dogs’ for the very first time the previous Saturday and were led to believe (by the track promoters) that all the greyhounds love to race and that the track homes ALL the ‘retired’ greyhounds. A discussion followed, explaining what our campaign is all about and issuing the man with a leaflet and inviting him to visit our website. 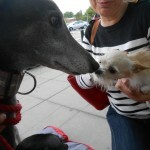 Sometime later, he took the time to return, to thank us for ‘opening his eyes’ and told us that after meeting our beautiful hounds and reading their stories and our leaflet, that his first trip to a greyhound track would definitely be his last visit. 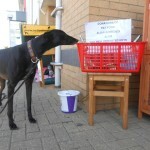 It is great that we are able to campaign face to face with the public and not only introduce them to the beautiful hounds who Afg have saved and homed, showing people what wonderful animals they are, in the hope more people will be encouraged to consider fostering or adopting greyhounds and in turn be able to save more lives while greyhound racing exists but to be able to also encourage more people not to support the cruel industry.